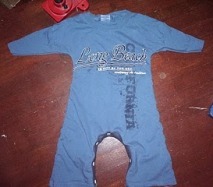 Ramona from The Burkeshires shows how to turn an old adult t-shirt into a romper for your toddler. In part 1, she shows how to make the body of the romper. In part 2, she shows how to add the crotch snaps. The old t-shirt material is soft on a little kid’s skin, and it adult-sized graphics look so oversized and funky on a toddler-sized garment.